Battlefront II now gives bigger end-of-match bonuses. That’s certainly an interesting way to speak about a series of decisions so ill-informed that EA have been constantly shifting their approach to the issue. Rewards have been raised, prices have been lowered, and microtransactions were temporarily turned off in the wake of significant dissatisfaction. The situation has escalated to the point where several governmental agencies are investigating claims that the game’s microtransactions constitute gambling. It does sound like that’s a genuine sentiment, however, as Jorgunsen says it’s not 100% confirmed that microtransactions will be re-added to the game. According to Gamespot, discussion is focused on “when or if” they will return, and if they do, exactly how that will happen. 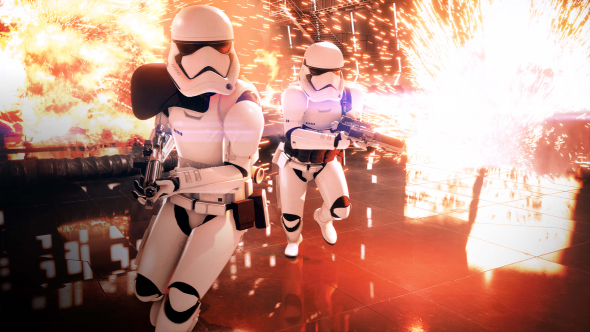 Despite the controversy, Jorgunsen says Battlefront II is seeing “great retention,” and that updates and new content, as well as interest in The Last Jedi, will continue to drive sales throughout the holidays.